Identity theft is a growing threat in our increasingly connected society. While the Internet may make it easier to do things like pay bills or file our taxes, it also makes it easier for thieves to get sensitive personal information like social security numbers that can help them steal your identity. That information can be used to open lines of credit or even to drain your accounts. You would think that you would be safe submitting information to a trusted organization like the Internal Revenue Service, but even that government giant is vulnerable to hackers. It learned that lesson the hard way a little more than a year ago when its website was hacked and the information for hundreds of thousands of taxpayers was stolen. The IRS shut down its Get Transcript Online service for over a year after the hack, but it just reopened it last month after strengthening security measures for the service. The Get Transcript Online feature of the IRS website allows taxpayers to request a transcript of one of their previous tax returns. Many times, taxpayers need this document when applying for a mortgage or for college financial aid. Some may just want a copy of the record because they lost their copy of their tax return and they want it for their personal financial accounting. In the past, the only way you could get this transcript was to order it by phone or by mail. You then had to wait five to 10 business days for the transcript to arrive. If you are applying for a mortgage or have another time-sensitive need, this could be too long to wait. The online service was introduced to expedite the process and make the request more convenient. In order to minimize the risk of future data breaches, the IRS has increased the authentication requirements for using the online service. Now, anyone who wants to request a tax transcript online will have to provide a legitimate email address, a phone number that can receive text messages, and specific financial information, such as a credit card number or loan number. Verification codes will be sent to the email and phone number that the taxpayer must then enter on the site. While these additional steps will not eliminate the risk of online data breaches, they will certainly reduce the risk significantly. Some may find the extra steps to be more cumbersome, but they are necessary in order to protect your most sensitive financial information. After providing all the information requested, new users will have to submit an emailed confirmation code and provide financial account information to verify identity. They will also have to submit a verification code that is texted to their phone. When new users create their user name and password, they will also be asked to create a site phrase and to select a security image for the site. If you previously created an account for the service, you will have to log in with your previous user name and password and then provide financial information to verify your identity. You will then have to submit a confirmation code that is texted to your phone. Though the process may seem a bit involved, it is worth going through it to get the information you need. Your tax transcript can be especially useful when you are seeking professional IRS tax help in Cave Creek, Arizona. Your tax lawyer or accountant can look at the transcript to get previous tax information to amend a return, defend an audit, or put together a financial history, for example. 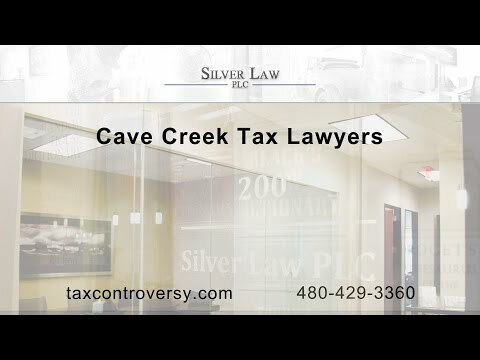 Silver Law PLC provides IRS tax help to individuals and businesses in Cave Creek for a variety of issues. Our tax lawyers represent clients in audits, civil and criminal tax litigation, tax collections and more. We also assist with innocent spouse relief, foreign tax reporting and other issues. Call us today to work with an experienced Cave Creek tax lawyer to protect your rights.